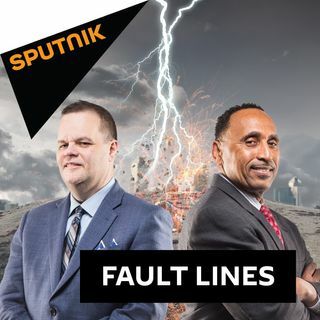 On this episode of Fault Lines, hosts Lee Stranahan and Garland Nixon discuss the current tension in Syria and what may occur in the coming days. Journalist Vanessa Beeley joins the hosts for a special report live from Syria to detail what she has been seeing and hearing on the ground inside the war-torn country. Geoff Shepard - Author of 'The Real Watergate Scandal' | How Does Watergate Compare to the Mueller Investigation? Maram Susli - Geopolitical Analyst | What Does the Future Hold for Syria? Tom Luongo - Geopolitical Analyst and Publisher of the Gold Goats 'n Guns Newsletter | Is Europe in the Process of Being Balkanized? James Corbett - Founder of the Corbett Report | What Are Some Little Known Facts and Details Related to September 11, 2001? There are a number of comparisons that have been made between Watergate and Robert Mueller's ongoing investigation into President Trump and his associates. On today's show, the hosts are joined by Geoff Shepard who worked on the Nixon defense team and is the author of the book, 'The Real Watergate Scandal,' to discuss the similarities and differences between these two investigations. Hurricane Florence continues to approach the US East Coast as assets mobilize to deal with the potential devastation. Jamie Lovegrove, a Political Reporter for the Post and Courier in South Carolina returns to the program to discuss these ongoing preparations for Hurricane Florence as well as to talk about the rising profile of UN Ambassador Nikki Haley. Recent election results in Sweden are the latest indicator that many of the people of Europe are beginning to favor more populist and nationalist governments in their home countries. Geopolitical Analyst Tom Luongo joins Garland and Lee to talk about the current state of the European Union and if Europe is currently going through the process of balkanization? For the final segment, the hosts are joined by James Corbett, founder of CorbettReport.com, to discuss the events and aftermath of September 11, 2001. What are some of the important facts of 9/11 that have been under-reported, and why is there still so much confusion surrounding the events of that day?